Wikipedia is considered to be the largest online database of information. 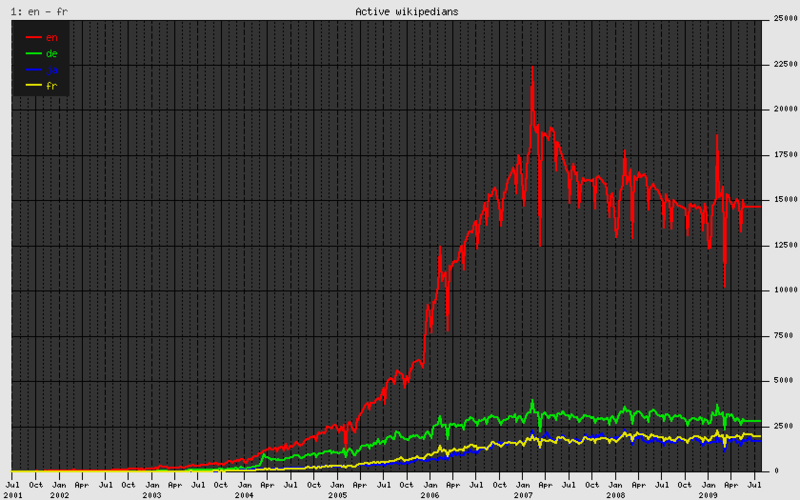 Launched in 2001, Wikipedia has had exponential growth and have celebrated it’s 3 millionth article in August 2009. However, in the past month, both Times Magazine and Fast Company have written about the decline in user participation in Wikipedia in the last two years. In 2006 declines in the number of article posts surface and in 2007 users began participating less frequently in editing articles. Times pointed out one reason behind this decline. This is certainly the case with Wikipedia. In my own attempt to write a new article on the site, I had to research for possible topics for several hours before finally finding that an article on “Krause Springs” had not been published yet. Creating new articles in English are especially difficult now that millions of articles have already been published. System Operators on Wikipedia are given more access to the site and therefore have more power than other users. In the past few years, Wikipedia has become more aggressive in editing and deleting content which is a positive move to become a more “reliable” source of information, but also extremely negative in terms of attracting new users to participate and give their own opinion. If potential new users attempt to publish articles only to have them heavily edited or deleted, these participants become discouraged and revert back to just being passive observers, thus perpetuating the already slanted demographic in the Wikipedia community. In order for a more diverse population to participate and for future growth to develop, Wikipedia will have to create a more user friendly system where new users are not constantly battling with Wikipedia authorities to participate in the community. Couldn’t agree with you more. I just added a couple of trivial info to the site, just to see that half of it was nominated for change of removal within 12 minutes ! I don’t know how the integrity can be kept without moderation, but i do know there is a delicate balance between keeping it user friendly and assuring its integrity. Masters of Media » Response to sarahnats: What is Causing the Decline in Wikipedia Participation?